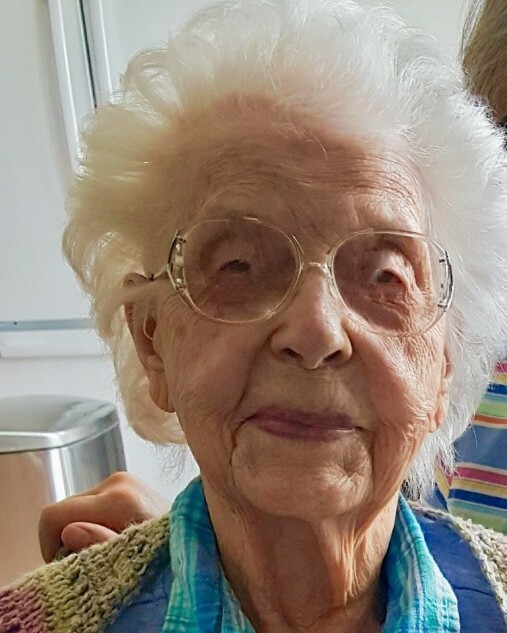 Fern Genevieve Scrivner, 102, of Nampa ID, passed away peacefully Sunday, April 7th, 2019, at the home of her daughter, Janice Miller, in Columbia Falls, Montana. Fern was born July 22, 1916 in Minatare, Nebraska, to Milton Jay and Augusta Mae Casteel. She graduated from Pasadena Nazarene College where she met Fulsom Charles Scrivner and they were married September 1, 1939 in Alhambra, California. Throughout her life she has lived in Nebraska, Colorado, California, Arizona, New Mexico, Illinois, and finally, Idaho. Fern and Fulsom were missionaries to Native American tribes throughout the Southwest for 29 years. She was a school teacher and an ordained minister of the Gospel. Fern is preceded in death by her husband, Fulsom, and her daughter Carol Mae and son-in-law Joe Parker. She is survived by five children including spouses, sixteen grandchildren, thirteen great-grandchildren, and three great-great-grandchildren. Funeral services will be held at 11:00 am, Tuesday, April 16th, 2019 at Bethel Church of the Nazarene, 3001 12th Avenue Road, Nampa. Burial will follow at Hillcrest Memorial Gardens, Caldwell, ID.